Hi, Lois here with my Monday card. 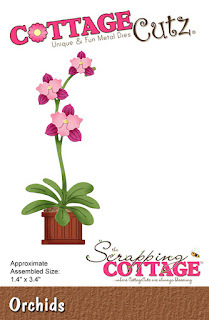 While waiting for receipt of the "Just for Guys" release from CottageCutz, the design team is still spotlighting dies from the Mother's Day release. My card today features the Orchids die and came together very quickly. I started by cutting the orchid pieces from white cardstock. I colored the pieces using Copic markers and constructed my orchid plant. I then cut the card base as follows: 8 1/2" x 5 1/2" white cardstock, scored at 4 1/4"; 4" x 5 1/4" patterned paper; and the tag from white cardstock 2" x 4 1/2". I cut the corners of the tag with a punch then punched a hole in the top center of the tag, threading some baker's twine through the hole. I then stamped the "happy birthday" sentiment at the bottom of the tag and glued on the orchids. I adhered the tag to the card at an angle, using large foam pop dots and finished off the card by adding a few enamel dot stickers. Be sure to check out the CottageCutz/Scrapping Cottage website for the new "Just for Guys" dies, which are on sale at 25% off for a limited time. Beautiful card. I like the layout and the colors. Such a pretty card! The layout of the card with the tag looks fabulous! Such beautiful colors too!